ww2dbaseAircraft designer Sydney Camm of Hawker Aviation began working on a monoplane version of the Fury biplane fighter starting in 1934, knowing that the British Air Ministry had interest in such a development. His design team located at Canbury Park Road in Kingston upon Thames near London, England, United Kingdom initially named this project "Interceptor Monoplane to F.5/34" (the latter being an Air Ministry specification reference number). In Aug 1934, the team submitted the design to the Air Ministry, and it was indeed well received, so much so that within a month the ministry would request British aircraft manufacturing firms to compete for a new specification, F.36/34, whose requirements were nearly identical to the capabilities of this new aircraft design from Camm's team. Hawker officially submitted the design to the British Air Ministry on 4 Sep, and the prototype of what was to be named Hurricane took its first flight from Brooklands in Surrey, England, United Kingdom a year later on 6 Nov 1935, with George Bulman in the cockpit. Hawker was so confident of this design that it had geared their factories to produce 1,000 units before the British military placed its first order. The order came in Jun 1936, for 600 machines, and it was not until later that month that the "Hurricane" name was made official. When the war began in Europe in Sep 1939, 497 were delivered. About one year into the war, on 7 Aug 1940, 2,309 were delivered. ww2dbaseGiven that the design had its roots in the Fury biplanes, these new fighters actually resembled much more like their WW1-vintage forefathers than their WW2-era contemporaries. Although the general appearance would remain the same throughout the long production life of this design, the details would evolve throughout the years. Mark I machines, for example, were equipped with Merlin C engines and two-blade wooden propellers; by the time the Mark V variant was available in the mid-1940s, the powerplant had been upgraded to Merlin 32 engines that directed power to Rotol four-blade propellers. While many of the changes that took place over the production life were to upgrade the performance or to address problems, some were due to suit war situations; for example, while Mark I aircraft burned glycol, Mark II machines stepped down to a 70-30 glycol ratio to ease on the consumption of this precious strategic material. While the Hurricane fighters' fabric-covered wooden framing wings were legacies of the outdated Fury design, this weak link ironically saved many pilots' lives during the war, as explosive shells from German fighter cannons passed through them without detonating; the use of fabric and wood also meant some of the front line mechanics could perform some of the structural repairs on the wings without having to send the aircraft to repair facilities in the rear. In terms of production, the simple construction also meant that they could be produced in large numbers with relative ease; during the Battle of Britain, Hurricane fighters consistently outnumbered their more capable and rather more famous successors, the Spitfire fighters. While the more maneuverable Spitfire fighters engaged in dogfights with German fighters, it was often the Hurricane fighters' tasks to take down German bombers. 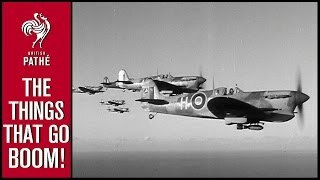 Aside from the Battle of Britain, Hurricane fighters also played an important role in the defense of Malta, as well as other campaigns. While the Spitfire fighters attracted more attention from their inception, Hurricane fighters could be said as the real workhorses of the RAF, for that Hurricane fighters shot down more hostile aircraft than any other aircraft models in British inventory during WW2. ww2dbaseAside from being fighters, Hurricane aircraft also served in close ground support, tank buster, and convoy combat air patrol roles. In the latter, 70 Hurricane fighters fought off Axis forces of a greater quantity during Operation Pedestal; even though carrier HMS Eagle was lost, the convoy successfully delivered large quantities of supplies as well as 36 Hurricane fighters to the garrison at Malta. ww2dbaseDuring the war, Hurricane fighters also served in many of the Commonwealth military forces such as New Zealand and South Africa. The Free French air force, based out of Britain, also operated some Hurricane aircraft. Many Hurricane fighters were also given, sold, or licensed to be built in other nations such as Russia, Yugoslavia, and Finland. Kate Moore, The Battle of Britain. 4 Sep 1934 Hawker submitted the "F.36/34 Single-Seat Fighter-High Speed Monoplane" design to the British Air Ministry. 18 Dec 1934 Hawker Aviation furnished further engine data to its manufacturing engineers. 18 Feb 1935 The British Air Ministry issued Contract No. 357483/34 to Hawker Aviation for one example of what was later to be called Hurricane fighter for evaluation. 23 Oct 1935 In England, portions of the prototype Hurricane fighter were transported from Kingston upon Thames to Brooklands for assembly for a soon to be held test flight. 3 Nov 1935 Test pilot George Bulman began familiarizing himself with the prototype Hurricane fighter at Brooklands in Surrey, England, United Kingdom. 4 Nov 1935 Hawker engineers informed test pilot George Bulman that the engine of the prototype Hurricane fighter failed the 50-hour endurance test; Bulman ordered a careful evaluation of the engine, but refused to cancel the maiden flight scheduled for two days later. 6 Nov 1935 The prototype Hawker Hurricane fighter made its maiden flight over Brooklands near Weybridge, Surrey, England, United Kingdom, with George Bulman at the cockpit. Bulman failed to file an official report of the flight, but in his casual notes he expressed minor concern with the engine running at high temperatures, minor concerns with the creaking and flexing of the canopy, and general satisfaction with this new aircraft design. Hurricane fighters would later become the first RAF monoplane with enclosed cockpit, eight guns, and retractable landing gear, and the first to exceed 300 mph. 5 Mar 1936 Hawker's prototype fighter K5083 was delivered to Martelesham Heath airfield in Suffolk, England, United Kingdom for testing. 4 Jun 1936 The British Air Ministry issued Contract No. 527112/36 to Hawker Aviation for 600 units of the soon-to-be-named Hurricane fighter design. 8 Jun 1936 Hawker Aviation issued fuselage manufacturing drawings of the soon-to-be-named Hurricane design to its production shops. 27 Jun 1936 The Hurricane fighter design officially received its "Hurricane" designation. 17 Aug 1936 The Hurricane prototype fighter took another test flight at Brooklands near Weybridge, Surrey, England, United Kingdom. 25 May 1937 British Royal Air Force took ownership over prototype Hurricane fighter K5083 at Martelesham Heath airfield in Suffolk, England, United Kingdom. 29 May 1937 Hurricane prototype fighter K5083 was revealed to the public during the Empire Air Day exhibitions at Felixstowe and Martlesham in Suffolk, England, United Kingdom. 12 Oct 1937 Hurricane prototype fighter K5083 took its final flight; on the same day, the first production Hurricane fighter took its first flight at Brooklands near Weybridge, Surrey, England, United Kingdom. 25 Dec 1937 The first production Hurricane fighters began to be delivered to No. 111 Squadron RAF at Northolt, Middlesex, England, United Kingdom. 1 Jan 1938 Although Hurricane fighters had been arriving for the past week, this date was the official date that No. 111 Squadron RAF (based at RAF Northolt, Middlesex, England, United Kingdom) converted to operate these newly developed fighters. 10 Feb 1938 J. W. Gillan, commander of No. 111 Squadron RAF, made a flight between RAF Northolt, Middlesex, England, United Kingdom and RAF Turnhouse (now Edinburgh Airport) in Edinburgh, Scotland, United Kingdom in a Hurricane fighter only 48 minutes, assisted by a 80mph tailwind. 2 Mar 1939 A Hurricane fighter was sent to Canada in preparation for license production. 27 Oct 1939 The Gloster Aircraft Company produced its first Hurricane I fighter. They would deliver one thousand machines by the end of 1940 and attained a peak production rate of 130 Hurricane aircraft per month. In total Gloster would eventually build 1,850 examples for Hawker Aircraft. 11 Jun 1940 The first Hurricane Mk II prototype aircraft, actually a converted production Mk I example, took its first flight. 6 Jun 1942 In North Africa the RAF deployed its "secret" Hurricane IID Tank Buster Squadron which had been training to deliver low-level attacks on enemy tank formations using Hurricane fighters fitted with dual 40mm cannon. Within ten days the squadron would make 37 sorties, damaging 31 enemy tanks (although very few were completely destroyed). 14 Mar 1943 The first production Hurricane Mk. IV fighter, KX405, was completed. 15 Jun 1945 Hurricane fighters of British No. 351 Squadron RAF were transferred to Yugoslavia. 27 Sep 1946 The first of the two-seat Hurricane trainer aircraft to be transferred from Britain to Iran departed Langley Airfield in Berkshire, England, United Kingdom. The Yugoslav Government ordered twenty-four Hurricane I from Hawker. The first batch of 12 being delivered from December 1938, the second twelve being shipped in February 1940. In addition the Yugoslav Government placed orders for forty Hurricanes to be built under license at the Rogozarski and Zmaj factories. A monthly delivery rate of eight machines was anticipated but by the time of the German invasion less than twenty Yugoslav built Hurricanes had been completed. On April 6, 1941 the Yugoslav Air Force possessed thirty-eight Hurricanes (18 with No.51 Squadron, 14 with No.33 Squadron and 6 with No.34 Squadron). These saw considerable action against the advancing German columns over Zagreb and Bosnia, before eventually being destroyed by their pilots to stop them falling into German hands. Hurricanes served with several British Commonwealth squadrons in the Desert Air Force. They suffered heavy losses over North Africa after the arrival of Bf 109E and F-variants and were progressively replaced in the air superiority role from June 1941 by Curtiss Tomahawks/Kittyhawks. However, fighter-bomber variants ("Hurribombers") retained an edge in the ground attack role, due to their impressive armament of four 20 mm cannon and a 500 lb (230 kg) bombload. Information about Prototype Hawker Hurricane listed in file photo. The Hurricane first flew in 1935 powered by a Rolls Royce engine with a fixed pitch two blade wooden propeller. The fighter was built with steel tube covered by fabric, and the first fighters had no bullet-proof windshields or armor plate it was easier to build than stress-skinned fighters like the Spitfire. Skeleton of the Hurricane with the exception of metal sheeting around the cockpit,firewall engine cowling, propeller spinner and metal hatches and panels the rest of the aircraft was fabric covered easy to repair over sheet metal. Fabric covering had its advantages bullets would pass right through without damage to the airframe, except that luckly hit on the engine or other important equipment. Early models also had wings fabric covered as well. Hawker Hurricane prototype, K5083 was flown by Hawker test-pilot T.P. Fitzgerald. Lets not forget the MK 2C that had the 4 wing mounted 20mms..
Canada Car and Foundry in Fort William, Ontario, CANADA, (where the Chief Engineer, Elsie MacGill, became known as the "Queen of the Hurricanes") was responsible for production of 1,400 Hurricanes, known as the Mk X.